ACOSS has come to the amazing and unprecedented conclusion that for "an increasing number of Australians, housing affordability is a serious problem that affects their ability to work". A quarter of people battling with housing stress regularly skip meals in order to pay their rent. Tasmania's Tarkine rainforests are important for their flora which has links to the ancient continent of Gondwana, and for their lichens and fossils which help tell the story of Australia's ancient flora and its evolution. Mining companies like Venture Minerals are desperate to exploit the minerals beneath Tasmania's environmentally significant Tarkine area. Demand for metals being placed above the value of the environment. 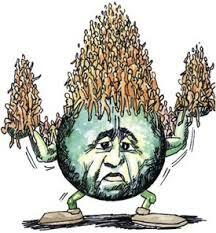 GM Crops - a solution for over-population? GM crops are being seen as an “answer” to human overpopulation, a “big Australia” and a way of securing food for the future. The global challenge is to produce 70% more food in the next 40 years. GM has the potential to increase hunger around the globe. GM has the potential to increase hunger around the globe. Read more about GM Crops - a solution for over-population? Growth is choking our city, our public transport, our parking lots, and streets and causing more and more "shortages", and rising costs - particularly in hospitals. Does it take a death of someone waiting to get some funding? More democracy in the system would solve a lot of the problems. When workers are too scared to complain vigorously, the patients aren't heard either. Does anyone have a choice in this system? Who is responsible? Aid agencies have accused the world's richest countries of ''wilful neglect'' in failing to fund appeals to save millions of Africans from famine. Nearly 11 million people are at risk of starvation in the Horn of Africa, including 500,000 children who "are suffering from imminent, life-threatening severe malnutrition," according to UNICEF. 1.6 million additional children under five years old are severely malnourished. Australia's "Bush Capital" kangaroo slaughter, where's the science? Parks and Conservation Service Manager Daniel Iglesias says up to 3427 kangaroos will be "culled" in the ACT. It's simply a matter of thinning out some of those nuisance and feral kangaroos to allow genuine natural ecosystems and native species to flourish, and of course a government department will want to be seen protecting endangered flora and fauna! It appears to be based on sound science, but is it? Read more about Australia's "Bush Capital" kangaroo slaughter, where's the science? Studies have shown that the use of these major roads will continue to increase in the years to come. Do we really want our city of Marvellous Melbourne to turn into Los Angeles in a desperate attempt to "solve" our traffic problems? The North East link tunnel/freeway would not alleviate traffic congestion and destroy valuable biodiversity parklands and wetlands. Australia is on course to miss the bipartisan target of a 5% reduction in CO2 emissions by 2020. The emissions for the 12 months to December 2010 are 0.5% higher than the previous 12 months, according to figures released 18th April. While Australians are supposed to be reducing greenhouse gas emissions, at the same time our government is pushing for high rise developments and population growth. Victoria's perceived increased kangaroo numbers made headlines when they forced the cancellation of the Hanging Rock Australia Day races. KIAA executive officer John Kelly said developing a management plan was the first step toward legalizing commercial kangaroo harvesting in Victoria. They said that a ban on processing kangaroos was "robbing" farmers of $13 million per year. Kangaroo Industry Association of Australia. National parks are protected because they have unspoilt landscapes and a diverse number of native plants and animals. This means that commercial activities such as farming are prohibited, and human activity is strictly monitored. The return of cattle to the Alpine National Park could thus be illegal. Climbing human population's food sources threatened by bumblebee population decline? Read more about Climbing human population's food sources threatened by bumblebee population decline? Studies have found that whales increase the population of plankton which bolsters the removal of carbon dioxide from the atmosphere. If Japan is justifying their illegal whale slaughter under the smoke-screen of "scientific research", then their junk science must be exposed to enforce their removal. Clearly, it is erroneous to claim, as the three whaling countries tout, that whales compete with their commercial fisheries. Rather, they enhance them. With 2236 people arriving every week in Victoria - 1800 of those moving to Melbourne- there is scant recognition of the amount of infrastructure needed to support these numbers. Every third or fourth home of Point Cook is of an Indian family, out of the 1500 homes. In fact, they all call Point Cook "Mumbai Cook"! So many of our manufacturing industries have disappeared overseas, that opportunities for training and apprenticeships are limited, despite the provisions of vocational training at TAFES. Why should we be having an immigration program to address skill shortages when we should be developing a better educational and training framework that produces and exports our own skilled workforce? Read more about Skills shortage crisis? An estimated 40% of food on our supermarket shelves contains palm oil. Palm oil typically costs the lives of up to 50 Orang-utans each week. Possible extinction in 20 years. Over 85% of the world's palm oil comes from Malaysia and Indonesia. See also, for some hope, "Restoring Eden"